It is official! Summer is here and we have kicked off the season with our first tour stop...well, sort of. Mariano Ullibari of the Parachute Factory hackerspace in Las Vegas, NM was one of the first to sign-up for the Sparkfun National Tour. Earlier this year, Mariano started up a Hacker Scout program within the Parachute Factory to provide a space for young children to explore and tinker with various types of technology and fabrication mechanisms. The Hacker Scouts have access to 3D Printers, 3D Scanners, large-format plotters, screen-printing and a wide-assortment of other tools. Between juggling all of our schedules, we weren’t able to fit their hacker-scout weekend into our planned RV departure, but thankfully for Mariano and the Hacker Scouts, New Mexico is part of our "Neighbors" region, and Las Vegas is a mere 5 hour drive from us. Brian Huang, Education Engineer, and Dav Nowinski, Kitting Specialist, took on this inaugural event! Now - onto the classes. 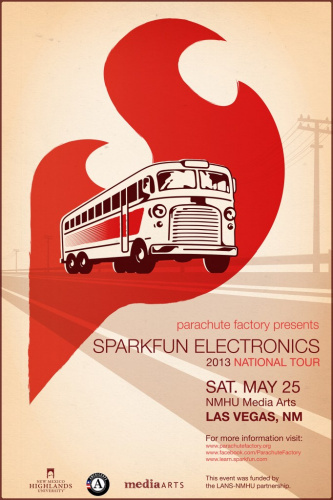 The Parachute Factory partnered with the New Mexico Highlands University to host this event within their Media Arts Lab. We ran two half-day sessions. In the morning, we had about 25 Hacker Scouts from the local area come out - ages ranging from about 8 to 16. We piloted Modkit Micro with our Lilypad Development Board with this group. The graphical programming environment in Modkit and the Lilypad Development Board proved to be an amazing combination for working with the Hacker Scouts group. It was easy enough for our youngest of kids -- yet challenging enough for some of our high school aged kids to explore, create, and hack. We had kids create "Knight Rider" style flashing LED patterns, color mixing their favorite tones and hues with an RGB LED, and making melodies with the buzzer. We wrapped up the day with a session for adults in the area. We were joined by folks from Que Labs hacker space in Albuquerque, NM, Art Institute in Chicago, and faculty and staff from Highlands University. We got to see some high-end user testing - especially from the father-son duo, Morgan and Bandit, from Quelabs. After a long and exciting day with the Parachute Factory and the Hacker Scouts, we wrapped up our trip with a visit to Blake’s LotaBurger. 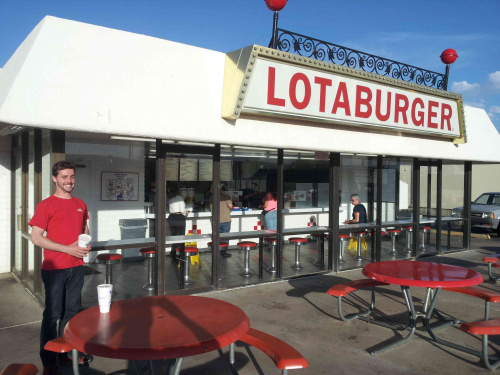 We couldn't leave without stopping by one of the local establishments for a juicy hamburger topped with green chile. The famous New Mexico green chile!!! It was absolutely amazing. Can't you tell how happy Dav is after that burger!!! We want to thank Mariano, the Parachute Factory, and all of the kids and families that joined us! While Las Vegas, NM may be considerably smaller than Las Vegas, NV -- we were pleasantly surprised to see the strength in the local hackerspace / maker community. For a town with 15,000 people, the community is rich with arts, creativity, and the desire to build and make things. The official send-off for the RV is June 6th. We're busy stocking the RV, getting our kits ready, and training our crew to hit the road! We can't wait. Jeff Branson will be taking the helm on the first official leg of the Sparkfun Education National Tour!